Extreme challenges place extreme demands on your equipment. The Eiswand Advanced ML Hooded Jacket Men from the Eiger Extreme Collection is tailored to these demands. Thanks to a waffle structure on the inside, Pontetorto® Tecnostretch provides optimum moisture management to keep you feeling comfortable even in strenuous situations. 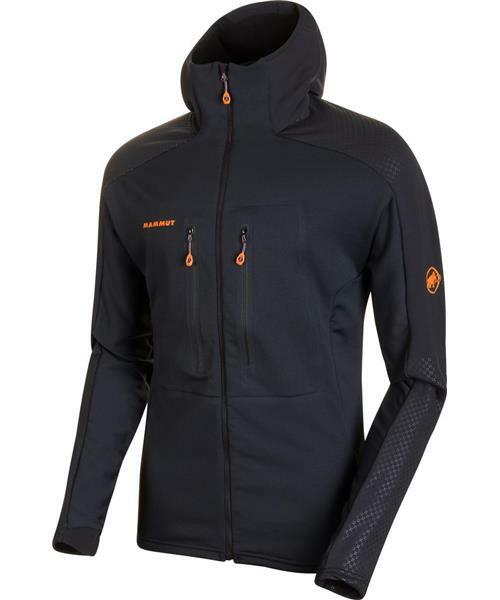 Mammut® Vertical Motion Technology™ enhances the jacket's ergonomics for alpine movement sequences. Flat seams increase comfort and avoid chafing under a backpack. Thanks to intelligently positioned cross-over pockets, the Eiswand Advanced ML Hooded Jacket Men is compatible with a climbing harness, to bring the summits within your reach.